So...if you are not moving you are not learning? I think that's it in a nutshell. I have to stop beating around the bush. You know, I know, and everyone knows that a chance to reflect on one's learning is where the learning actually happens. That's why, when we were first developing the Math in Your Feet program, my wonderful co-creator Jane Cooney said, "We have to have a workbook to go along with the dance classes." Yes, I know the label of 'workbook' has a lot of connotations, including busy work, and if you can think of a better name, please let me know. Residency Journal? That might be better. Anyhow, Jane's idea was that the workbook would be the place for written reflection, word study (math and dance words/concepts), a record of the students' creative work (including mapping the patterns), and extension activities that look more like recognizable math problems related to the residency work. For instance: "Make a scale drawing of the dance space you use in dance class." 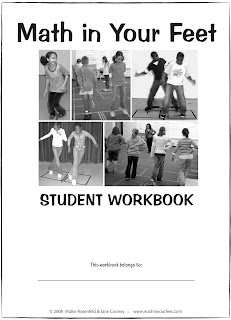 As I've discussed elsewhere in this blog, I build the bridge between math and dance in my workshops, but it is up to the classroom teacher to make time to use the workbook and bring this learning back to the page. Over the years, I've notice teachers becoming more and more stressed by the push of their district's curriculum and by testing, so much so that just bringing their kids to me for an hour a day for a week is now about all they can handle. Maybe they get their kids to complete the daily reflection journal prompt and the word study, but that's about it. Math in Your Feet, unfortunately, sometimes ends up being just a 'fun' event (and don't even get me started on 'fun'...). There's also sometimes a perception that teachers carry that we're not doing any real learning while we're moving, the least of which would be math. I once actually heard a teacher say to his students, when leaving my class, "When we get back to the classroom it's time for math." An obvious sign that students are skipping the written work and reflection is when I start to hear the kids say, "Where's the math, anyway?" Or, "Why are we doing this?" Not every kid says that, and more often than not, kids still love dancing and making up their dance steps. But I can tell they don't have the same kind of facility with the math and dance terminology. I can tell they don't remember what we did the day before or why. I can tell that they don't really fully understand the process and concept of transforming their patterns. It's an opportunity lost, if you ask me. Last week I was at Templeton Elementary School in Bloomington, IN where I live. (Thanks to an Indiana University ArtsWeek 2011 grant!) As the week went on I got lots of fantastic reports about kids who had never wanted to pick up a pencil who were excited to go back to their classrooms and write about their work in Math in Your Feet. I've heard this before, actually. Engage a kid's emotions, give them something real and personal to write about, and they'll respond. And, along with that, REQUIRE that they complete their residency workbook assignments. Even if it takes longer than expected. Even if other things have to be pushed aside for the week. Even if the math topics in this program don't align with your lesson plans for the week I'm at your school. There's the potential for deep, thoughtful engagement with both the math and dance content in this program, but it's all water through a sieve if kids don't get a chance to reflect on their learning and make it their own. Are kids smarter than they were five years ago, or is it just that I've stopped looking for the 'right' answer? Are my students more perceptive than they were, or is it just that I am more receptive to what they have to say, even if it's not 'time' for it? Are fourth graders smarter than they used to be, or is it just that I am less interested in 'moving the lesson forward' and more interested in listening to their reasoning? Are kids understanding the program better now or is it just that I'm finally really hearing what they have to say? Have they always had insightful observations, or is it just that I am more open to multiple interpretations of the same event? I think we know where this is going. Kids have always been smart and I haven't always known what to listen for. It's been really exciting this week to hear my students' observations, thoughts and insights. I am, for the first time, really enjoying the process of teaching this program. Maybe for the kids, yes, but not for me. So let's focus on me for a moment. This issue shows up in my teaching. When I am thinking too closely about the math, my feet don't move in class. They don't talk. I forget to use the one great attention getter I have that nobody else does -- my tap shoes! I forget to start our sessions with the art and instead hurry forward to the math. My most recently completed residency at Christel House Academy has made me think of this. The residency was part of a pilot project by Young Audiences to evaluate the structure of their new Signature Core Services and the elements that interact to create a quality arts learning experience. They wanted to know if and how these elements were brought out in this particular arts-based programming. But me? I was worried about how I was teaching the math and was surprised that they didn't even care about that (for the purposes of the pilot). That shows you where my mind is these days, doesn't it? I've also spent a lot of time overly focused on the dance (mostly in the first few years of developing the program) but these days? These days, as I teach, I have mostly been taking the dance for granted. I am quite surprised and somewhat alarmed to realize that I've been seeing dance as a means to an end. I'm horrified, actually! This is not really supposed to happen in an integration and I'm really supposed to be on the side of the dancing right? Yes, we're dancing and moving our bodies at least two thirds of each workshop, but I am realizing now just how much my mind has been over at the math camp. I think this might be because I've been spending much of my creative work time this fall focused on learning about math. I've been trying to figure out what math means: What is math really? What other kinds of math are we doing in this program besides the ones I know about already? What kinds of conversations are these kids having about the math while they're dancing? The learning I've engaged in, I believe, has been a full out creative process, one full of questions, dead ends, frustration, problem solving (What don't I know? Where do I need to go to find out? What sorts of questions do I need to ask? Am I asking the right questions?) and 'aha!' moments. My intellectual explorations have affected my teaching in the past as well. Earlier in the development of Math in Your Feet, when I was still trying to figure out how the dance and math fit together I was deeply engaged in exploring the integration aspect of the program and my teaching at the time reflected this. Although I did have questions about the value of teaching the integration (and still do; mostly I think it's a good tactic) I was working it out in the classroom none-the-less. So here's a question: If the basic flow of the residency content stays the same, does it matter if my interests bias our focus, even if slightly? Does it matter if I'm over in the math camp while teaching a dance-based program? Maybe my loyalties to both camps are like siblings vying for their mother's attention. I am essentially acting as the content specialist for both camps simultaneously and it's hard to pay attention to both equally at the same time. Maybe I embody the reality of integration and the inherent tensions therein? It's interesting to reflect on this question because, since it's just me responsible for both content areas, we can't blame the tension on personality conflicts between teaching artist and classroom teacher. Maybe none of this matters because one's best teaching comes when you're enthusiastic, engaged and truly interested in the subject matter. Maybe it doesn't matter which camp I'm in on any given day or year because the truth is the kids are moving, they're dancing, they're thinking intensely with their bodies and they're learning a whole lot of math, all at the same time. I've been told on numerous occasions that I think too much, but who was it that said an 'unexamined life is not worth living'? (I just Googled it, it was Socrates.) I think it is important for me to ask questions about where my loyalties lie even if, in the end, it doesn't matter. I'm a process person, I live in the moments between. And, I know I'm a better teacher when I'm inspired, whether it be by math or dance or reading Carla Hannaford's book Smart Moves like I did in the Fall of 2009. Hopefully my dance friends will put up with my math obsessions for a while. I'll be back soon!